A Creative Crafthouse original design sized to fit a standard 12oz beer bottle. Picture shows a Budweiser bottle in place (not included lol). 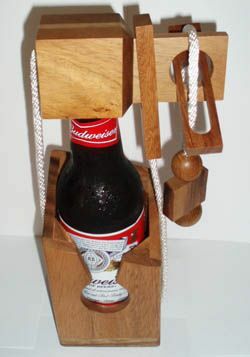 This puzzle will securely "lock" a beer bottle into place such that it cannot be opened until you solve the puzzle. Its quite tricky. Best to try sober... Put it on your home bar and watch the fun or give it as a gift with his/her favorite beer trapped inside. Creative Crafthouse has provided clear instructions on how to get the bottle in place and "set" the puzzle.